Burma has now had its third peace conference. The first, in January 2016, was organized by former President Thein Sein, who to this day is also a top general in the country’s military dictatorship. The second and third were held in August and then this year, although the latest was postponed from February. These were arranged by Aung San Suu Kyi, State Counselor, who – formerly at least – had opposed the military. Such an assertion is absurd. It is time for a reality check. First, all of the conferences have been described as Union, meaning nationwide. Therefore, nominally at least, this was the third Union Peace Conference, or UPC. The Burma Army itself, or Tatmadaw. Its allies who signed ceasefires starting in the 1990s, thereby abandoning revolutionary struggle. Many of these groups, or their leaders, subsequently focused on making money, ranging from resource exploitation to the narcotics trade. A number in recent years also willingly transformed into regime Border Guard Forces. Its allies among the different local militia that are spread around the country, and which also typically profit from resources or narcotics. And, the groups which remain true to their people and who refused to sign the NCA. Interestingly, the last includes some of the regime’s former allies in the north such as the KIA, who resumed their revolutions when the Burma Army unilaterally reversed their ceasefires. Also, long-standing ally the UWSA seems to have changed sides as well, since it is now openly assisting these groups. In summary, the current revolutionary pro-democracy resistance includes the following: members of the UNFC (KIA, SSA-N, KNPP, NMSP, ANC, LDU, and WNO, although the KIA and WNO have signaled their intention to resign from the group); the Northern Alliance (UWSA – and with which the WNO intends to unite, KIA, SSA-N – it will apparently remain in both alliances, TNLA, MNDAA, AA, and NDAA); and the Naga – NSCN-K – whose goal is to establish a unified Nagaland nation together with communities in Northeast India. 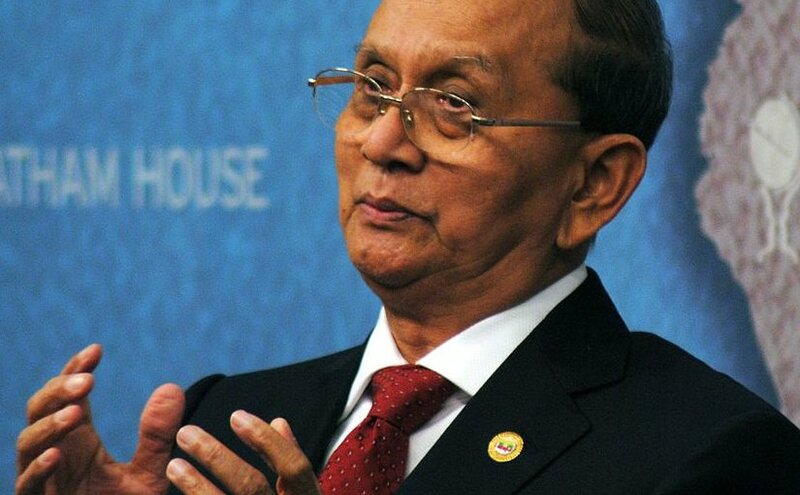 Burma’s Thein Sein. Photo Credit: Chatham House, Wikipedia Commons. Thein Sein based the first conference on the NCA, which is a complex document focused more on political issues (such as the formation of a federal structure for Burma), than peace. Indeed, it does not even oblige its signatories to stop fighting. This lack of an on-the-ground ceasefire is at the insistence of the dictatorship, which clearly does not want any legal hindrance (other than international law) to get in the way of its continuing attacks against the EAOs. The pro- democracy resistance itself has called repeatedly for the first step to be a real ceasefire. Because of this, the EAOs view the NCA with extreme suspicion. They recall that the dictatorship pushed through its 2008 Constitution following years of stage-managed meetings, and a fraudulent referendum. The NCA is considered to be a similar regime tactic, a new means to delay real peace and which will also put Burma’s ethnic nationalities at a permanent disadvantage. On the other hand, UNFC members are still trying to work with the document, by pushing for additional changes. They are continuing to negotiate in good faith. The dictatorship has responded though that alterations are forbidden. Surprisingly, Suu Kyi also decided to have the NCA as the basis for the second and third meetings. (The third UPC was postponed because no additional groups were willing to sign.) She even rebranded the meetings as “21st Century Panglong.” This implies that they were successors to the 1947 conference held by her father and which led to the signing of the Panglong Agreement, through which treaty ethnic equality – on paper at least – was enshrined. Burma’s Aung San Suu Kyi. Photo by Claude TRUONG-NGOC, Wikipedia Commons. By doing this, Suu Kyi joined forces with the dictatorship. Both she and the top generals are members of the Burman ethnic group. She has repeatedly demanded that the EAOs sign the NCA in its current form as a precondition to participate in the conferences. She held to this position even though, as just mentioned, the NCA does not have as its goal actual peace, and since it does not ensure that ethnic interests are satisfied. At the latest session, General Min Aung Hlaing dictated the exact opposite of the Panglong Agreement. 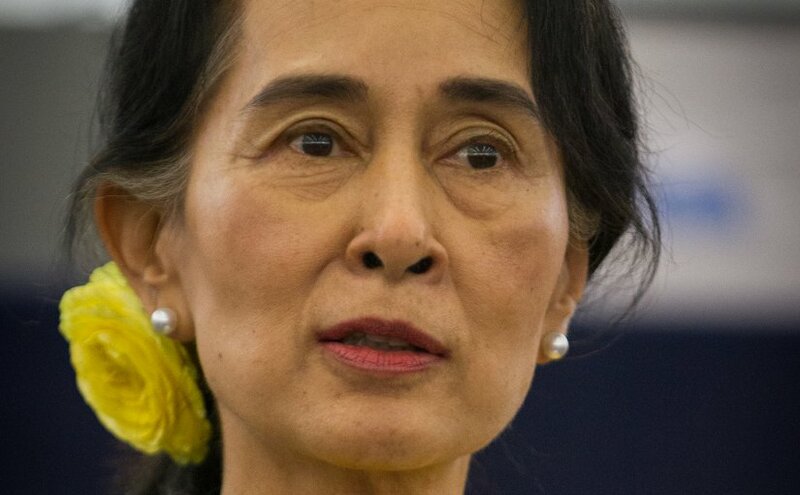 Suu Kyi herself has implied that the ethnic nationalities should accept repudiation of the Agreement’s legal provisions, and instead settle for a lukewarm and ultimately meaningless “Panglong Spirit.” This argument, which is a subterfuge – it hasn’t been debated openly, is so contemptible that the UPC should now be named the 21st Century Anti-Panglong Conference. In contrast to her optimistic words, this is what really happened at the latest UPC. The UNFC members said that they would not attend unless they were given full rights of participation. Suu Kyi had demanded that they accept “observer” status, and when they refused this was adjusted to “special guest.” But since nothing had really changed – only the label, they stayed away. Surprisingly, the Northern Alliance did attend, including its members the KIA and the SSA-N, who also – for the moment at least – still belong to the UNFC. (The KIA has received a public backlash from the Kachin community for going.) This was arranged following intense pressure from China. Even with this, the Northern Alliance returned home early. They did not stay the extra day that was added to sign a conference agreement. Because of this, and the absence of the UNFC, the agreement that was signed, even though it had many general “points,” was essentially meaningless. It did not cover the major outstanding issues for Burma, and it included no signatories from among the groups that are actually fighting for freedom. In fact, even NCA signatories the SSA-S and ALP refused to sign, since they had not been allowed to hold community forums. They said they would not commit their groups without receiving public input. The only armed group signature on the agreement was that of KNU turncoat Kwe Htoo Win, and who fraudulently signed on behalf of all the EAOs. Similarly, the signature on behalf of the political parties (by a representative of the Democratic Party Myanmar) was done without all of their consent. Following this outcome, and in contrast to Suu Kyi’s rosy summary, the first appraisals were – accurately – negative. In damage control, and as reported in The Star Online, Suu Kyi’s spokesperson blamed the EAOs for the failure because of their demand for greater autonomy. The spokesperson made no mention at all of the true core issues – the Burma Army’s obstinacy and its continuing war of colonial aggression against the ethnic nationalities. The main disputes at the conference involved the ethnic nationalities’ right of secession from the Union of Burma, and the issue of how to restructure the military if the day ever comes that real peace is achieved. For the first, both the Burma Army, in Min Aung Hlaing’s speech, and Suu Kyi, through many different statements, have been demanding that the ethnic groups give this up. The right of secession is established law in Burma. It was initially agreed at the Panglong conference and then formally included in the 1947 Union of Burma Constitution. So, and once again, a major point of contention at the latest UPC arose from the military and Suu Kyi’s efforts to get the ethnic nationalities to renounce Panglong. The second dispute involved the nature of a post-peace national army, with the regime insisting that it, meaning Burman generals, must retain full command including over absorbed ethnic nationality forces. This in turn is simply a restatement of its long-standing insistence on DDR – Demobilization, Disarmament and Reintegration, which for the EAOs is tantamount to surrender. Clearly, Burma’s military dictatorship, and now with the open and unwavering support of Suu Kyi, has no intention of yielding on any of its basic demands. Because of this, the UPC was not even a real negotiation. Instead, it was a hoax, carried out to benefit various parties and to deceive both the EAOs and the entire general public of the country. The question, then, is where does this leave the people, particularly for their long-denied dream of peace? The answer – in a hopeless position. Burma Army attacks against the Northern Alliance continued throughout the UPC, including with a significant escalation, which is still underway, once it ended. Peace requires the Burma Army to declare an actual ceasefire (to which the EAOs would immediately agree), followed by a pullback of its troops from ethnic nationality areas, starting with its bases next to local villages. But, at the present there is no prospect that the regime will ever willingly do this. For freedom and democracy, were peace to be achieved nationwide, there is then the question of the 2008 Constitution. To be democratic, the Burma Army and the ethnic armies must be integrated through SSR – Security Sector Reform – and in a fair way (with the EAOs having responsibility for security in ethnic areas); the entire national army must be put under the direct control of – made subordinate to – democratically-elected leadership; the military must relinquish control of its three ministries to this government; and, a new Rule of Law must be established, which ends the impunity for crimes now enjoyed by Burma Army soldiers, police, and other pro- regime groups and parties. Ultimately, for Burma to be free, power in the country must be transferred from the military, and Suu Kyi – who has also been acting like a dictator, to the people. However, and just as with the issue of peace, none of this is likely to be achieved. Indeed, Suu Kyi now backs the dictatorship’s Constitution, saying that she will not address changing it until after all the EAOs have signed the NCA, which she of course understands will never occur. Finally, and most unfortunately, the people of the country will not receive justice for the dictatorship’s crimes of which they have been – and continue to be – victims. There will be no end to the impunity. The justice system including the courts; the legal code, such as Telecommunications Act clause 66(d), which is now being used to imprison an entirely new generation of dissidents; and the actual conditions in the prisons, will never change. The problem of course is that talk – a negotiated peace – cannot succeed if one of the parties, in this case the Burma Army, is not sincere. In fact, since Suu Kyi is not only an intermediary – she is a full participant in the negotiation as well – we can say that two of the parties are insincere. Suu Kyi autocratically represents both the government and the political parties, of which the NLD is dominant. And, she is on the side of the generals. She has even opened a second front in their overall divide and conquer strategy. The regime had divided the EAOs by enticing some to sign individual ceasefires. She has expanded this by demanding that all the groups sign the NCA to be able to participate in the “peace process.” This has created the new split between NCA signatories and non-signatories. Fortunately, Suu Kyi and Min Aung Hlaing’s two-on-one strategy to force the EAOs to surrender was not successful. It turns out that they are not all corrupt, and also that they cannot be defeated. They have determined armies, and with the country’s rough terrain can draw out asymmetrical guerrilla warfare forever. The solution to Burma’s problems has not changed since Ne Win seized power in 1962. The dictatorship must be defeated, by popular uprising or armed revolution, or a combination of both. Clearly, the people of the country are the losers in the UPC process. But for some parties it didn’t fail at all. They got exactly what they wanted. The UPC is a carefully staged mirage – a magician’s trick. All that is happening, with the dictatorship, Suu Kyi, and also the U.S., Europe, and China, is a well-orchestrated effort to distract the people of Burma and to condition them to accept the fact that they will never truly be free. For such “power-players,” the conference was an important step in a larger criminal conspiracy. There will be another talk fest in six or so months, and then another after that, etc. Meanwhile, nothing fundamental will change. In other words, by following the UPC there will never be real democracy, just a fake “disciplined democracy” – i.e., a dictatorship. All of this is essentially applying the model that has already been established for China. As a closing note, China’s role is worth highlighting. Some analysts say that the Burma regime’s relationship with its neighbor has changed materially over the years, in particular in response to the U.S. ending its sanctions. I believe this view is dubious. China backs the military dictatorship. It always has, and it always will. They are blood brother tyrants. The last thing China wants is for Burma to be a real democracy. It seems that China intervened in the UPC to save Suu Kyi an embarrassing loss of face. Why? Because the Burma regime has been using her quite effectively as its apologist, and China knows that having the ability to continue to exploit her weakness is an effective strategy against real change. This is very clever. China backs the Northern Alliance militarily, and which kills Tatmadaw soldiers. But the Burma dictatorship doesn’t really care about such losses. Regime soldiers are cannon fodder after all. (Neither does China care about its own villagers who are killed by stray bombs.) It is better for both if there is no peace – if the war continues for years and years in a low grade way, with periodic but controllable flare-ups. China will help with this, but at the same time try to prevent the Northern Alliance from ever pursuing a real war of liberation. Ultimately, nothing will change. Suu Kyi will become decrepit and then die. The rule of Burma’s generals will get more and more entrenched, as they make deals with international corporations. Indeed, many of these corporations will be Chinese. Continuing warfare and accompanying human rights atrocities will dissuade all but a few truly horrible Western companies from making the leap. It’s amazing how people tend to believe only the things that they can actually see. But, there is always much more going on that meets the eye. There are obviously meetings – secret meetings – between Chinese representatives and the military dictatorship. I would be shocked if there wasn’t a well-trodden path to Min Aung Hlaing office – and Than Shwe’s mansion. That’s right: Than Shwe is absolutely still calling the shots. He’s healthy, and he’s pulling the most important strings. That’s part of the reason why he is rarely seen in public. He doesn’t want to call attention to himself. The so-called changes in the Burma-China relationship, including the former’s public embrace of the West, are a fiction. Than Shwe and the Chinese autocrats are playing the West, and the people of Burma, and Suu Kyi, in a real world game of Go. The Northern Alliance needs to resist China’s influence. It should fight to win, and recruit the other UNFC members and the loyal KNU units to the battle. Everyone else should take to the streets.